* Please notice the photo is only for sample. Please read the description for the actual size. 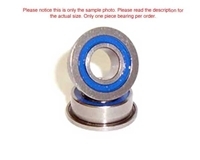 Only one piece bearing per order. APS Racing Dual metal shielded ball bearings 3x8mm Flanged Steel retainers for durability. Top & bottom dual metal shields for maximum smoothness. Includes: 1 pc. Bearing per pack. APS Racing Dual metal shielded ball bearings 7x11x3mm Steel retainers for durability. High quality dual blue rubber sealed bearings. Excellent debris protection. Low maintenance. Factory pre-lubricated light oil for smoothness. 8x16mm Steel retainers. APS Racing Dual metal shielded ball bearings 5x11x4mm Steel retainers for durability. High quality dual blue rubber sealed bearings. Excellent debris protection. Low maintenance. Factory pre-lubricated light oil for smoothness. 1/4x3/8 Flanged Steel retainers. High quality dual blue rubber sealed bearings. Excellent debris protection. Low maintenance. Factory pre-lubricated light oil for smoothness. 5x10mm Steel retainers. Sub-C Single Cell Shrink Tube, Xtra Thick, 20pcs. APS Racing Dual metal shielded ball bearings 3x8mm Steel retainers for durability. APS Racing Dual metal shielded ball bearings 5x13mm Steel retainers for durability. APS Racing Dual metal shielded ball bearings 1/4 x 3/8 x 1/8 inch Flanged Steel retainers for durability. APS Racing Dual metal shielded ball bearings 3/16" x 3/8" x 1/8" Flanged Steel retainers for durability. 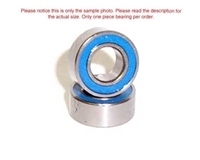 APS Racing Dual metal shielded ball bearings 3x6x2.5mm Steel retainers for durability. APS dual teflon sealed ball bearings 5x10mm Flanged Steel retainers for durablity. Top & bottom dual sealed for maximum smoothness. Low to medium maintenance. APS Racing Dual metal shielded ball bearings 3/16x5/16 Steel retainers for durability. APS Racing Dual metal shielded ball bearings 3x7mm Steel retainers for durability. APS Racing Dual metal shielded ball bearings 4x7x2.5mm Steel retainers for durability. 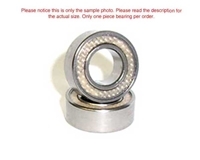 APS Racing Dual metal shielded ball bearings 4x8x3mm Flanged Steel retainers for durability. APS Racing Dual metal shielded ball bearings 6x12mm Steel retainers for durability. APS Racing Dual metal shielded ball bearings 6x13mm Steel retainers for durability. High quality dual blue rubber sealed bearings. Excellent debris protection. Low maintenance. Factory pre-lubricated light oil for smoothness. 12x18mm Steel retainers. High quality dual blue rubber sealed bearings. Excellent debris protection. Low maintenance. Factory pre-lubricated light oil for smoothness. 4x7X2.5mm Steel retainers. High quality dual blue rubber sealed bearings. Excellent debris protection. Low maintenance. Factory pre-lubricated light oil for smoothness. 8x14mm Steel retainers. APS dual teflon sealed ball bearings 12x21mm Steel retainers for durablity. Top & bottom dual sealed for maximum smoothness. Low to medium maintenance. APS Racing Dual metal shielded ball bearings 3/16x5/16 Flanged Steel retainers for durability. APS Racing Dual metal shielded ball bearings 3x6x2.5mm Flanged Steel retainers for durability. APS Dual metal shielded ball bearings 5 x 10 x 4mm Steel retainers for durablity. Top & bottom dual metal shields for maximum smoothness. Low to medium maintenance. APS Racing Dual metal shielded ball bearings 5x8x2.5mm Flanged Steel retainers for durability. 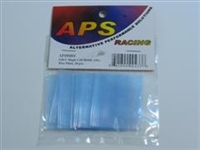 APS Racing Dual metal shielded ball bearings 1/4 x 3/8 x 1/8 inch Steel retainers for durability. APS Racing Dual metal shielded ball bearings 5 x 9 X 3mm Steel retainers for durability. APS Racing Dual metal shielded ball bearings 4x8x3mm Steel retainers for durability.